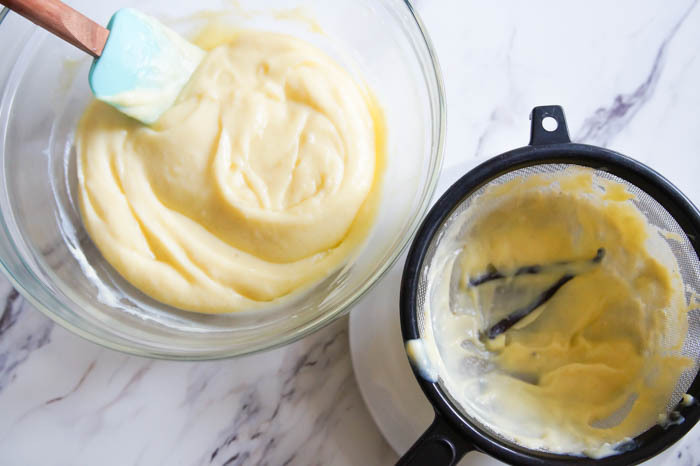 If you've been obsessed with the Great British Baking Show like I have been, you've probably wanted to run to the kitchen and whip up some Creme Pat or Creme Patissiere (Pastry Cream to you and me). 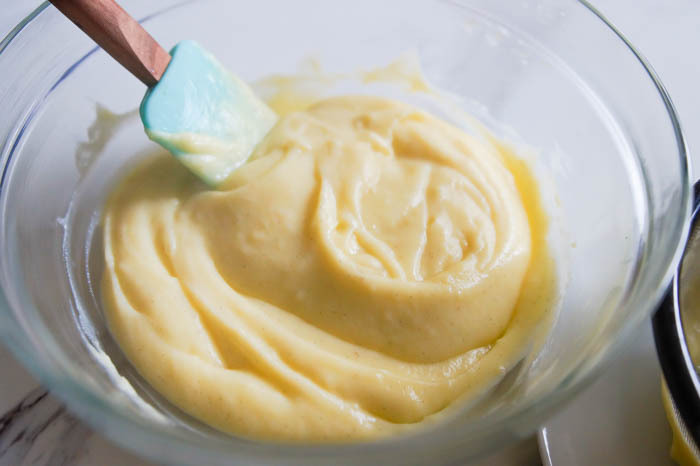 Pastry Cream is the filling for eclairs and other pastries. You'll need this for a recipe coming your way soon. A recipe you NEED to make, so start thinking about pastry cream. It really isn't hard to make; it just seems intimidating. Those vanilla bean seeds (and the pod) get heated in some milk with sugar and salt. 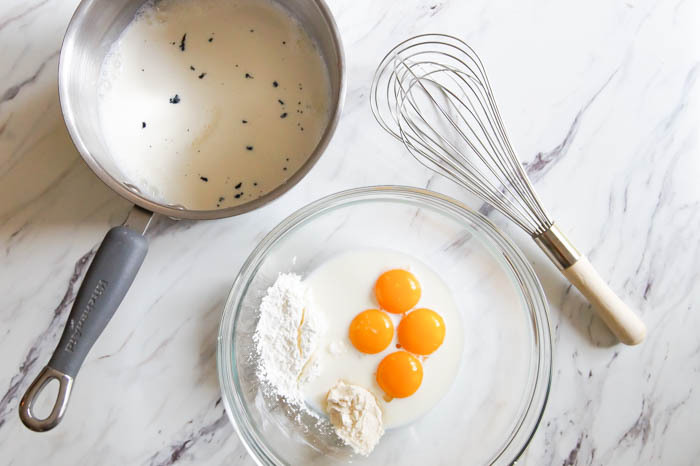 In a bowl, a little more milk gets whisked together with egg yolks, cornstarch, and flour. Here's the part that seems scary. You're going to temper the eggs. That means you'll gradually warm them so that they don't scramble. 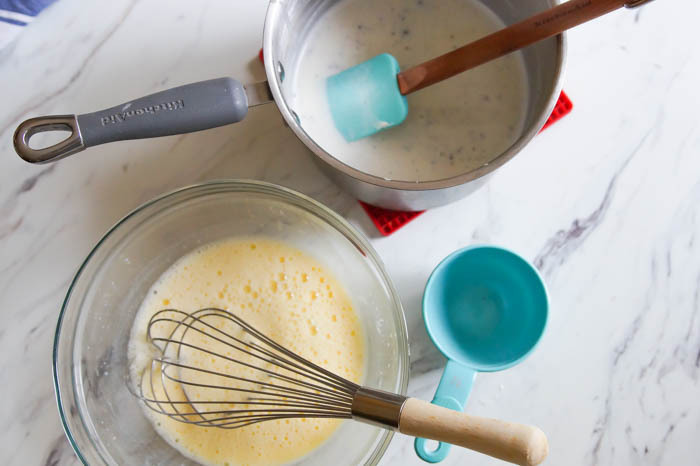 To temper, whisk some of the hot milk into the egg mixture. Then, you'll add that back into the pan and heat until thickened. The entire batch gets poured through a sieve. It'll be thick, and you might need to coax it through. The sieve will catch the vanilla pods and any lumps that might be in your cream. At this point, it's smooth and quite thick. One last part: butter. 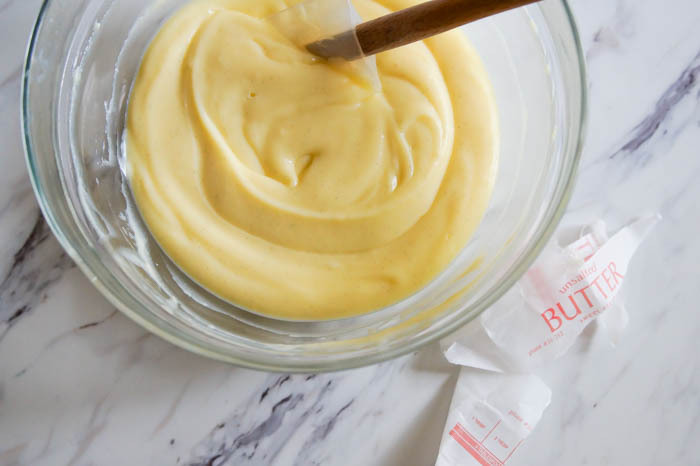 *cue angels singing* Stirring in the butter turns that lovely, thick cream into a silky, glorious filling that is ready for pastries...or for a spoon. Remember you'll be needing this soon. 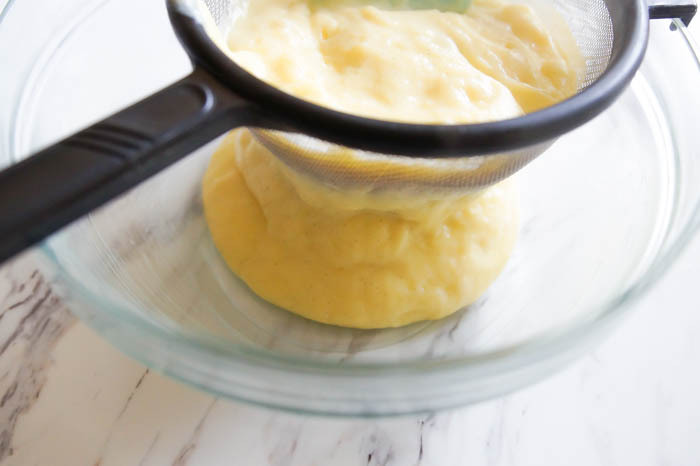 In a large bowl, whisk 1/4 cup milk, cornstarch, flour, and egg yolks. Set aside. Combine the remaining 2 3/4 cup of the milk, sugar, and salt in a medium saucepan. 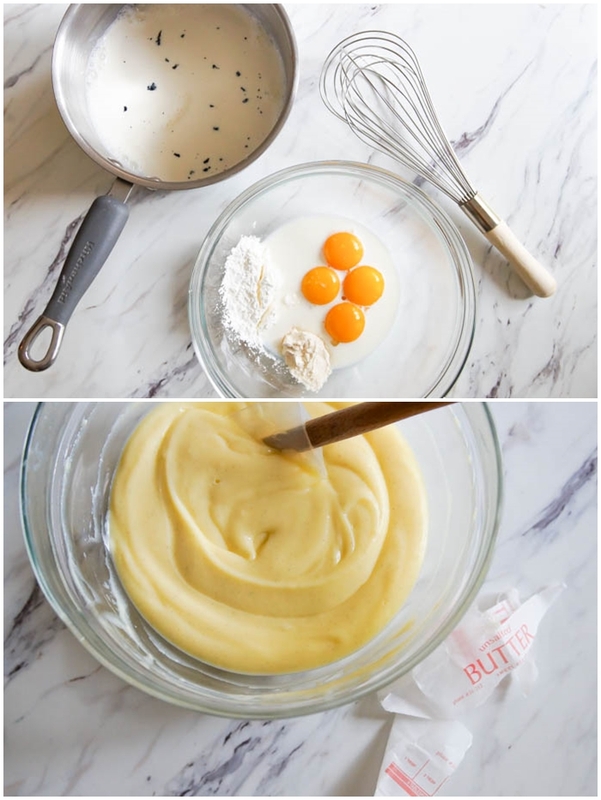 Split the vanilla bean and scrape out the seeds. 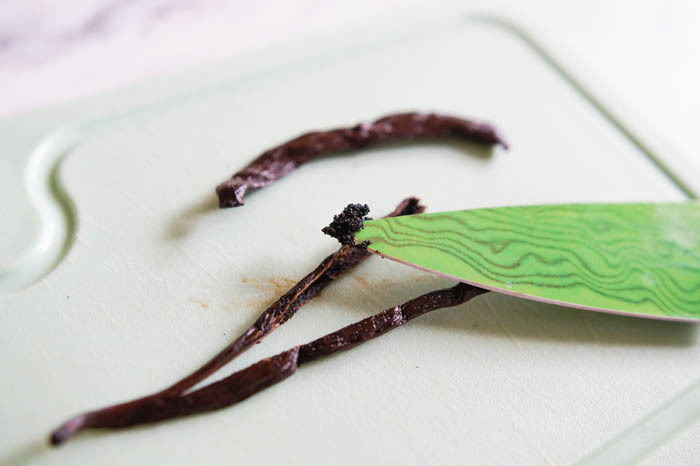 Add seeds and vanilla pod to the pan. Heat over medium-high heat until boiling. Remove from heat. 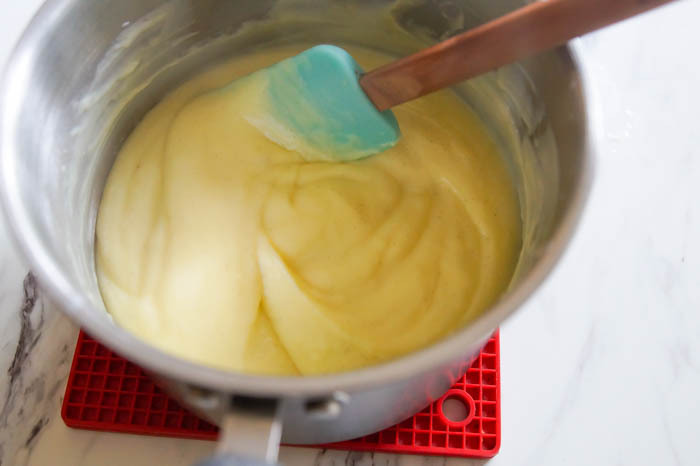 Gradually whisk about 1/2 of the hot milk mixture into the egg yolk mixture. Pour the egg mixture back into the pan. Heat on medium heat, constantly stirring, until the mixture comes to a boil. Boil for 30 seconds then remove from heat. Pour the mixture through a fine sieve placed over a bowl. Once the cream has gone through the sieve, stir in the butter until melted and combined. Press plastic wrap directly onto the cream and chill thoroughly before using. Can be made ahead 2-3 days and kept in the refrigerator. Pastry Cream. Creme Patissiere. Creme Pat. I think I love you. It sound so easy and super delicious! How long will this last? I'm completely obsessed with this show! I watch it over and over again trying to figure out the American equivalents for the British terms. Next on my to-bake list is frangipane! I love this show and tried to make the victoria sponge cake - guess what our self rising flour is different than British self rising flour. UGH! Such a great show:)The Bakewell Tart of the season we are watching..Mary's..mouth watering. Chocolate pastry cream would be divine!